PRIME MINISTER MALIKI:	(As translated.) I'd like to welcome the President of the United States, President George W. Bush. I would like to welcome you here as a guest. You have stood by Iraq and the Iraqi people for a very long time, starting with the -- getting rid of the dictatorship, helping the Iraqis to fight terrorism. 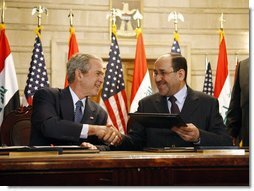 President George W. Bush and Iraqi Prime Minister Nuri al-Maliki shake hands following the signing of the Strategic Framework Agreement and Security Agreement at a joint news conference Sunday, Dec. 14, 2008, at the Prime Minister's Palace in Baghdad. President Bush said, " The agreements represent a shared vision on the way forward in Iraq." White House photo by Eric Draper Your visit today to Iraq, Mr. President, comes after the signing of the agreement between the two countries, which represents -- (audio drop) -- foundation and draws a road map that will govern and guide the relationship between the two states. I believe that Iraq, we have performed and have done great work in a cooperative and integrated way in fighting terror. We have succeeded in Iraq, and we hope that efforts also around the world will succeed in defeating terrorism. Today Iraq is moving forward in every field. Through the new Iraqi political system we are working very hard through this, as well as developing the Iraqi economy, and reconstruction of Iraq. We are doing all of this in order for Iraq to restore its rightful place among nations and among the world, and away from the previous reckless policies that focused on wars with the previous regime. The various political institutions have taken a very strong leadership position and the agreement was ratified, was approved by our political system, our parliament, and various institutions of the Iraqi government. They have approved and ratified the SOFA agreement and the withdrawal of American forces. We believe that these efforts culminated the height of real understanding and cooperation and friendship between Iraq and the United States. Now remains the part of implementing such an agreement. Now we are in the process of forming the proper committees that will carry out all elements of the various two agreements that were signed -- and I'm referring to the various fields, military, scientific, educational, commerce, as well as economic fields. President Bush, you have played a very supportive role in achieving and concluding this agreement and prior to the actual date of starting to implement this agreement, in January 1, '09 we already start working through the United Nations Security Council we are in the process of drafting a resolution that will make it very clear that Iraq no longer represents a threat to world peace and security. And also a resolution that will set the basis for the protection of Iraqi financial capabilities and bring Iraq back to its rightful place among world communities. Once again I would like to take this opportunity to welcome you, Mr. President. Once again I wish you a very joyful stay here in Baghdad and a safe trip back home. I am also looking forward to signing the joint statement here affirming two landmark agreements that solidify Iraq's democratic gains, that recognize Iraq's sovereignty, and that puts the relations between our two countries on a solid footing today and a solid footing tomorrow. They cement a strategic partnership between our two countries, and they pave the way for American forces to return home, as the war in Iraq approaches a successful end. The Strategic Framework Agreement formalizes, as it says in the agreement, formalizes "a relationship of friendship and cooperation" between our two countries in the economic, diplomatic, cultural, and security fields. Under this agreement, we will work together to bring greater stability to Iraq and the region, as well as promote trade and investment between our nations. We will work to strengthen democratic institutions. I'm sure you can remember what life was two years ago. When we were working together during that period such an agreement seemed unimaginable. Chaos and violence were consuming Iraq. The terrorists were seizing new ground, and the Iraqi people were beginning to divide the Iraqi people along sectarian lines. But you were determined, and I was determined to do something differently -- not to allow Iraq to fall into civil war. country. There is hope in the eyes of Iraqis' young. This is a future of what we've been fighting for -- a strong and capable democratic Iraq that will be a force of freedom and a force for peace in the heart of the Middle East; a country that will serve as a source for stability in a volatile region; a country that will deny a safe haven to al Qaeda. As a result of these successes, Mr. Prime Minister, the American people are safer. We're also signing a Security Agreement, sometimes called a Status of Forces Agreement. The agreement provides American troops and Defense Department officials with authorizations and protections to continue supporting Iraq's democracy once the U.N. mandate expires at the end of this year. This agreement respects the sovereignty and the authority of Iraq's democracy. The agreement lays out a framework for the withdrawal of American forces in Iraq -- a withdrawal that is possible because of the success of the surge. These agreements result from careful consultations with the Prime Minister and the officials of Iraq, as well as our diplomats and our military commanders. They represent a shared vision on the way forward in Iraq. The American people have sacrificed a great deal to reach this moment. The battle in Iraq has required a great amount of time and resources. Thousands of our finest citizens have given their lives to make our country safer and to bring us to this new day. We also praise the thousands of the coalition forces that came, and the sacrifices that those countries have made. And the Iraqi people have sacrificed a lot. They've suffered car bombings and suicide attacks and IEDs, and desperate efforts by terrorists to destroy a young democracy. Hundreds of thousands of Iraqis have stepped forward to defend this democracy, and many have paid a dear price. With these agreements, Mr. Prime Minister, we're honoring the sacrifices that I just described in the best possible way -- by building a freer, safer, and more hopeful world. By signing these agreements we're showing the people of Iraq the United States of America keeps its word. And we are showing the people of the Middle East that America stands firmly for liberty and justice and peace. And we are leaving the next President with a stable foundation for the future, and an approach that can enjoy broad bipartisan support at home. There is still more work to be done. The war is not yet over -- but with the conclusion of these agreements and the courage of the Iraqi people and the Iraqi troops and American troops and civilian personnel, it is decisively on its way to being won. PRESIDENT BUSH: Okay, everybody calm down for a minute. First of all thank you for apologizing on behalf of the Iraqi people. It doesn't bother me. And if you want some -- if you want the facts, it's a size 10 shoe that he threw. (Laughter.) Thank you for your concern, do not worry about it. Q (As translated.) A question, Mr. Prime Minister and others, you all talked about the various gains that will come as a result of signing this agreement. But just quickly I have one question about the withdrawal of American forces. Is this going to be an accelerated process that will happen quickly and perhaps prematurely? PRESIDENT BUSH: First of all, we're here at the Iraqi -- at the request of the Iraqi government. It's an elected government. There are certain benchmarks that will be met -- such as troops out of the cities by June of '09. And then there's a benchmark at the end of the agreement. As to the pace of meeting those agreements, that will depend of course upon the Iraqi government, the recommendations of the Iraqi military, and the close coordination between General Odierno and our military. These are very important agreements. And the government of Iraq worked very hard to get them through the parliament. PRESIDENT BUSH: So what if a guy threw a shoe at me? Q But you are also very (inaudible) about progress -- (inaudible). Do you consider this a victory lap? PRESIDENT BUSH: No, I consider it a important step in -- on the road toward an Iraq that can sustain itself, govern itself and defend itself. But let me talk about the guy throwing the shoe. It is one way to gain attention. It's like going to a political rally and having people yell at you. It's like driving down the street and have people not gesturing with all five fingers. It's a way for people to, you know, draw -- I don't know what the guy's cause is. But one thing is for certain -- he caused you to ask me a question about it. I didn't feel the least bit threatened by it. These journalists here were very apologetic, they were -- said, this doesn't represent the Iraqi people. But that's what happens in free societies, where people try to draw attention to themselves. And so I guess he was effected, because he caused you to say something about it. Now, in terms of the agreements, this is a major achievement. Is it the end? Absolutely not. There is more work to be done. And all this basically says is we made good progress and we'll continue to work together to achieve peace. That's what we want -- freedom and peace. And so, no, I'm honored to be back here. It's my fourth visit to Iraq as a sitting President, and I have been looking forward to this visit. It's very kind of you, Mr. Prime Minister, to have invited me here. The United States and the government of Iraq have negotiated two historic agreements: a Strategic Framework Agreement (SFA) that covers our overall political, economic, and security relationship with Iraq, and a Security Agreement – otherwise known as the Status of Forces Agreement (SOFA) – that implements our security relationship. Both agreements protect U.S. interests in the Middle East, help the Iraqi people stand on their own, and reinforce Iraqi sovereignty. The SFA normalizes the U.S.-Iraqi relationship with strong economic, diplomatic, cultural, and security ties – and serves as the foundation for a long-term bilateral relationship based on mutual goals. The Security Agreement guides our security relationship with Iraq and governs the U.S. presence, activities, and eventual withdrawal from Iraq. This agreement ensures vital protections for U.S. troops and provides operational authorities for our forces so we can help sustain the positive security trends as we continue to transition to a supporting role. The sustained security gains and increasing capacity and confidence of the Iraqi government and the Iraqi Security Forces are reasons the United States and the Iraqis were able to negotiate these agreements. These Agreements are what our troops have been fighting for and working toward: the moment when Iraqis could begin taking responsibility for security and governance on their own – something they could not have done two years ago. As we further transition security responsibilities to the Iraqi Security Forces, military commanders will continue to move U.S. combat forces out of major populated areas so that they are all out by June 30, 2009. The Security Agreement also sets a date of December 31, 2011, for all U.S. forces to withdraw from Iraq. This date reflects the increasing capacity of the Iraqi Security Forces as demonstrated in operations this year throughout Iraq, as well as an improved regional atmosphere towards Iraq, an expanding Iraqi economy, and an increasingly confident Iraqi government. These dates therefore are based on an assessment of positive conditions on the ground and a realistic projection of when U.S. forces can reduce their presence and return home without a sacrificing the security gains made since the surge. U.S. soldiers and civilians on the ground will continue to have uninterrupted and essential protections while serving in Iraq. Our troops will also continue to have essential operational authorities to sustain positive security trends seen in Iraq over the past year. 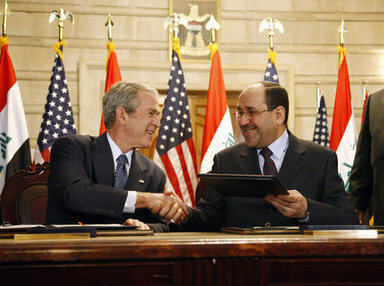 The Security Agreement also reflects the Baker-Hamilton Iraq Study Group’s recommendation that the Security Agreement include authorities for the United States to continue fighting al Qaeda and other terrorist organizations in Iraq, continued support for Iraqi Security Forces, and political reassurances to the government of Iraq. The SFA and Security Agreement with Iraq move us closer to the strategic vision we all hope for in the Middle East: a region of independent states, at peace with one another, fully participating in the global market of goods and ideas, and an ally in the War on Terror. Defense, security, law enforcement, and judicial cooperation and development. Further improvement of political, diplomatic, and cultural cooperation. Economic, energy, health, environment, technology, and communications cooperation. Joint Coordination Committees to monitor the implementation of the SFA. The SFA and Security Agreement do not tie the hands of the next President. This package provides a solid foundation for the next President to pursue a full range of policy options with Iraq. In a Communiqué issued on August 26, 2007, Iraq’s five principal political leaders – Prime Minister Maliki, President Talabani, Vice Presidents Hashimi and Abd al-Mahdi, and Kurdistan Regional Government President Barzani – requested an end to Chapter VII status under the U.N. Security Council and the establishment of a long-term relationship with the United States. This led to the U.S.- Iraq Declaration of Principles signed on November 26, 2007, which laid out a "table of contents" that the United States and Iraq would discuss in official negotiations. Bilateral negotiations began in earnest in March 2008. The SFA and Security Agreement, which are the result of the Communiqué and the Declaration of Principles, were approved by the Iraqi Cabinet and the Council of Representatives on November 27, 2008. On December 4, Iraq’s three-person Presidency Council endorsed the COR’s vote.